The 1998 Toyota Land Cruiser made its world premiere at the 90th annual Chicago auto show. It was larger, heavier, structurally more solid and substantially more powerful than its predecessor. Yet it delivers improved fuel efficiency, lower emissions and considerably quicker, more responsive acceleration. It is longer and wider, with slicker aerodynamics and major improvements in towing and cargo capacities. The 1998 Land Cruiser was the fifth-generation in the series and the first all-new Cruiser since 1991. 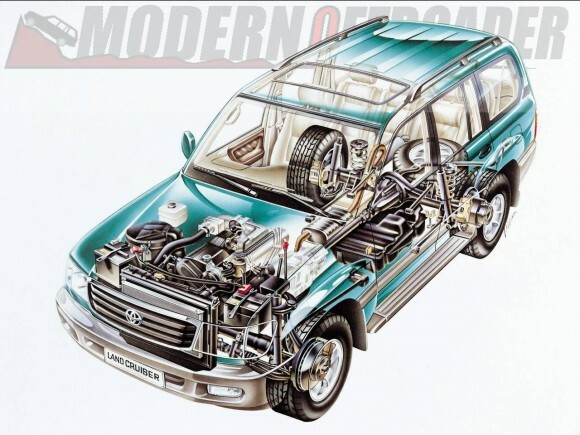 It is also the first Toyota vehicle of any type to be powered by a V8 engine. This generation lasted all the way till 2006. The all-new 4.7L 32-valve DOHC V8 is based on the engine used in the Lexus LS 400 series. The new engine was designed to provide a level of performance superior to any competitor in the luxury SUV class, especially in the area of low and mid-range torque. Additionally it was designed to deliver a new level of quietness of operation and best-in-class fuel efficiency, while meeting California’s Low Emission Vehicle (LEV) standard at the time. The engine produced 230 hp and 320 lb-ft of torque, and improved in output over the years. It will power the Cruiser from zero to 60 mph in 9.9 seconds, an improvement of more than two seconds in preliminary testing. It also will be certified as a low emission vehicle (LEV) by the California Air Resources Board, with a significant reduction in hydrocarbons. Preliminary fuel economy estimates for the new V8 were 14 city and 16 highway. As significant as is the addition of the new V8 engine in establishing the Land Cruiser’s benchmark credentials, the extensive re-design of the vehicle’s chassis is even more important. The initial development goal was to improve frame strength and reduce flex to a level superior to that era’s Range Rover. Engineers not only achieved this goal, but actually improved overall structural rigidity by 50 percent over the previous generation, to a level that is second to none among all SUVs. In order to improve both highway and off-road ride quality, Land Cruiser features an independent torsion bar front suspension. An independent front suspension (IFS) as large as the Cruiser’s requires the ability to move with much more precision than a typical solid beam axle. This precision was provided by the significant strengthening and reduced flex of the new chassis design. The Cruiser’s IFS provides a huge improvement in highway ride comfort, handling, steering precision and NVH reduction…over the previous generation’s rigid axle. Not only does this new IFS provide exceptional refinement to the Cruiser’s highway performance, it was designed to actually improve the vehicle’s off-road capabilities, long considered the best in the full-size SUV segment. The Cruiser’s rigid axle rear suspension remains nearly identical in design to the previous generation, with a few important refinements. The rear control arm and shock absorber bushing were redesigned to improve ride comfort by limiting the twisting effect on the control arm bushing. Additionally, the suspension stroke was increased and the rear axle housing strengthened. The result is a suspension system of unique refinement and precision. It is as comfortable, compliant and controlled off-pavement as it is on the highway, with a level of durability and reliability that even surpasses the previous generation. The Land Cruiser will again feature a full-time, two-speed four-wheel drive system linked to a four-speed automatic overdrive transmission. The full-locking differential system will again be offered as an option. However, due to the adoption of the IFS, the front differential locker will be discontinued. With the selector switch set in full lock mode and the transfer case set in low-range four-wheel drive, the system will split torque evenly front-to rear, with the rear wheels turning precisely in unison at the same speed, and the front wheels biasing torque according to individual wheel traction. Equally impressive is the Cruiser’s all-new ABS system, which now will be operational even in low- range four-wheel drive while the center differential is locked. The new system will determine road conditions according to changes in vehicle acceleration and road roughness. As road roughness increases, ABS influence will decrease. The system will also determine the slope of the road. As the slope increases, ABS influence decreases. The system is designed to enhance off-road braking performance, allowing ABS control on poor traction surfaces, while avoiding early activation on steep slopes. The Cruiser’s interior underwent a complete transformation for 1998, with special emphasis on comfort, roominess, utility and luxury appointment. The interior length and width were increased considerably for improved passenger comfort and cargo storage. Front seat slide was increased by nearly two inches and rear leg room by nearly three inches at the number two rear seats. Door openings were enlarged for easier ingress/egress, and the luggage area opening has been enlarged to improve the ease of cargo loading and unloading. Storage space was improved dramatically. Cup holders are provided in the front and rear of the console box and in the third seat quarter trim areas when equipped with an optional third seat. An overhead console offers three storage boxes plus an eyeglass/garage opener compartment. Pockets are provided in front and rear door trims, and there are separate compartments for tools and jack and first aid kit. Crash worthiness and occupant safety was a high priority with the new Cruiser. The use of nine cross members instead of six, increased structural integrity. The chassis side rail tips are now made into axial-compression type collapsible zones to ensure excellent energy-absorption characteristics.